A card is selected and returned to the deck. Magician removes one card from the deck and places it face-down inside the card case. The case has a window running through the center so the card is visible at all times. The case is turned around so the face can be seen and the spectator is asked if that is the selected card. 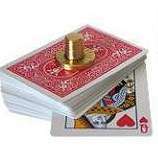 The magician seems surprised when the answer is "No" but he merely gives the case a tap and the card visibly changes to the correctcard.